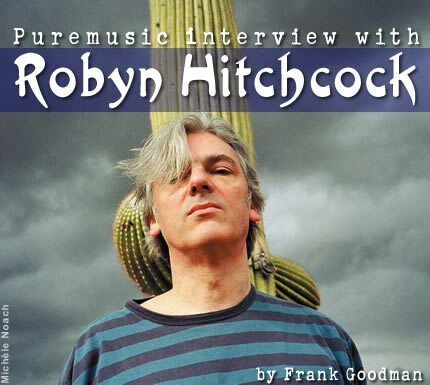 For our very first interview from Shanghai, we called upon the irrepressible Londoner Robyn Hitchcock, a man capable of and credited with any number of things. The Father of Indie Rock or College Rock are but two daunting titles I've heard thrown about--he is certainly one of the most respectable examples of how to thrive as a cult songwriter and artist, sometimes threading the corporate needle and sometimes self-released. He is also a painter, a short story writer, an actor, a humorist, a raconteur, and a philosopher. I imagine he is a welcome addition to any interesting party. Certainly on the phone we found him to be thoroughly engaging, a vital and witty man of the world. Robyn didn't release his first record till he was 24, but dozens have appeared since. The Soft Boys, a London pop band in the heyday of punk, make up the first leg of a long and ongoing career. Many famous acts in years to come would cite them as seminal influences, including R.E.M. In his early thirties he began to release solo recordings, beginning with the much heralded I Often Dream of Trains. He has just released his twelfth solo effort, Spooked, which marked the occasion of our conversation. We were aware of the phenomenon called Robyn Hitchcock and the Egyptians, but ignorant, alas, of their brilliance. (It's depressing sometimes, but you just can't get to it all, not and do anything yourself, you know.) So we're grateful to be catching on late, at any rate, and did so because we were intrigued by the fact that the new CD on YepRoc (one of our favorite labels) was made in Nashville with Gillian Welch and David Rawlings, the latter acting as producer. The pair were longtime fans of Robyn, and had once stood on line to get a record or a guitar signed, depending where you hear the story. When Robyn saw the two in concert in the UK, the spare genius of their uncanny chemistry inspired him, and a trip backstage revealed the mutual aspect of their admiration. Spooked is a lovely record of much magic, borne on the ability and tendency of all three artists to simply stand there with their instruments and pull it out of thin air. You can actually hear the spirit arise in many tunes, some that came out of moments of just jamming in a room where, thankfully, a mic was turned on and some tape rolling. The ghostly spirit that inhabits the unparalleled tracks of Welch and Rawlings' Time (the Revelator) can sometimes be heard on this record. And there are very playful moments as well, from all involved. The lyrics of Robyn Hitchcock fix upon many creatures of earth, sky, and water, as well as love songs to the "Televison," various "Demons and Fiends," and a great read of Dylan's "Tryin' to Get to Heaven Before they Close the Door." But like life, the conversation was as much about what we didn't get to talk about. My Shanghai long distance calling card ran out before we got to discuss the Soft Boys or Captain Beefheart, his violinist Deni Bonet or David Greenberger's The Duplex Planet, his Manchurian Candidate experience or making the concert film with Jonathan Demme, so many things. But you knew that, despite what a lovely guy he seemed to be, you couldn't say, "Let me run down to the Xiangyang Market and grab another card, I'll be right back." After all, he'd already turned the porridge off to begin the conversation, and was probably looking forward to getting back to that.